AUTh - Nanotechnology Lab LTFN and OE-Technologies participated in the IDTechEx Show 2019, held on April 10-11, at Berlin, Germany. Dr. Argiris Laskarakis (AUTh) gave an interesting invited talk about "Enabling Artificial Intelligence in Nano-manufacturing of Printed Electronics by In-Line Metrology and Control". We would like to thank all of you that visited us! Cornet Project together with OYSTER Project, MMAMA Project and NANOTEXNOLOGY Organizing Committee organizes the Workshop on Open Innovation and Standardization for materials characterization, materials modeling and materials process and manufacturing during NANOTEXNOLOGY 2019. A prerequisite for the enhancement of the innovation capacity of European (as well as global) industries in the fields of Organic Electronics and Nanotechnologies is the adoption of an Open Innovation environment which is an open framework process that can accelerate innovation through collaboration between expert stakeholders from academic, research and industrial communities. The adoption of an Open Innovation approach allows the breaking down of boundaries that prohibit the internal ideas and approaches to be adopted by other entities, which would facilitate the mutual progress in relevant fields without duplication of effort in national, European and global levels. Europe embraced Open Innovation in characterization and modeling by supporting the implementation of cutting edge research in selected topics that cover Organic Electronics, Microwave Microscopy and advanced nano-architectured and bio-inspired hard/soft interfaces. The combined efforts to promote and progress in state-of-the-art Scientific and Research fields requires the compatibility with internationally accepted roadmaps and frameworks, towards the development of future standards. During the Workshop a series of Invited talks, Oral and Poster presentations will be given by representatives from currently running EC R&D projects in that cover different aspects of Open Innovation for materials characterization & modeling (ranging from the atomic to the macro-scale or multiscale) applied on a broad range of subjects and applications. At the 7th Korea-EU NanoWorkshop Dr. Argiris Laskarakis presented an overview of the activities, pilot lines and in-line characterization facilities for Organic & Printed Electronics in Greece. He outlined the connection of OEs characterization, modelling and manufacturing data to industry applications (automotive, energy and construction) which is achieved in the Open Innovation Environment Platform being developed in the Horizon 2020 Project CORNET. The optimization of the manufacturing processes of Organic & Printed Electronics devices taking place in the Horizon 2020 Project Smartline were also thoroughly outlined. 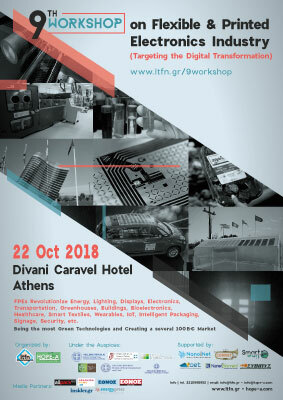 The Open Innovation Environment on Experimentation, Modelling and Manufacturing of Organic Electronics developed in CORNET was presented at the "9th Workshop on Flexible & Printed Electronics Industry (Targeting the Digital Transformation)" on 22nd October, in Athens. Dr. Argiris Laskarakis from Nanotechnology Lab LTFN explained how CORNET will be advancing the Flexible and Printed Electronics Industry. The Workshop will take place on October 22nd 2018, 09.00 am at the Divani Caravel Hotel, Athens. Download the workshop's poster from here. Cornet will present its innovations at the Workshop on 'EU Projects on Nanotechnologies & Advanced materials for OPVs and Perovskites PVs' during NANOTEXNOLOGY 2018! Τhe Workshop is co-organized by NAMEC,Nanotechnology Lab LTFN, HOPE-A and will gather Coordinators of European Projects, Technology & Market experts and representatives from the Industry. Do not miss it!